This man is a legend. I've already PM'd him and told him that but I felt the world(RG Forum)should know!!!!!!!! 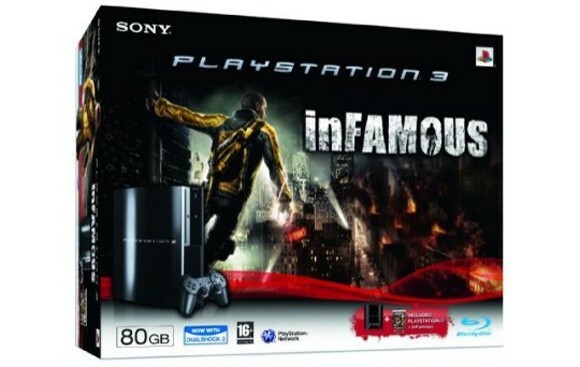 Images of a supposed 80GB PS3 + inFamous bundle have been circulating the video game blogosphere for the past few weeks. Sony has been hesitant to comment on the package, but a recent online retail listing cleared up the confusion -- the bundle is real, and coming to Amazon UK on May 29. Those interested in simultaneously acquiring the shockingly good superhero title and the system on which it runs can grab both for £279.99. We've contacted SCEA to find out if this deal is coming stateside. Consider our fingers crossed. seems like a pretty good deal to me! the demo is superb and i cannot wait for the game to come out now, might ignore my special edition embargo for this one. Well, this is the RG forum. It's quite interesting looking back on this thread and seeing the hype machine working its magic on what was actually a rather censored game. I think I got this on PSN for free when Sony screwed up and their network went down for a bit and offered games as compensation. Yet to touch it in all these years, and you're not quite encouraging me to finally boot it up with this post! I must have acquired it in the same way! Enjoying it so far, the controls take a bit of adjusting to, (especially after Aloy and Geralt) but the atmosphere, story and general feel are sucking me in. And now I've spotted that collectables appear on your minimap.. .
You may enjoy it. It plays very much like a middle tier open-world Spider-Man game (which I usually enjoy) but I just found it totally charmless and bland.